Ah, another Holiday episode is here, which means another year has come & (almost) gone. It's been a deep pleasure to bring you these episodes of the B&B boys over the past year.... thank you for being a part of the Kyle's B&B experience! There's much to look forward to in 2008. Starting in February, Kyle's B&B will officially go COLOR. I have received pretty much universal affirmation from everyone that this is a good direction to go, (OK, there are a few who do prefer the episodes in black & white... but don't worry. I'll continue to post the new episodes here in both color and black & white, so you'll always have the B&W option. And of course, this episode and the next few will be in black & white only). 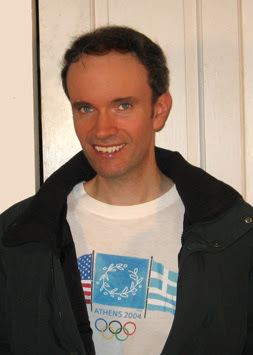 In any case, I wish you all the best this Holiday season....and joy and many miracles to you in 2008! Interestingly, being that new episodes are published here every other Tuesday, the next new episode is scheduled for January 1st, 2008... so be sure to come on back on New Year's Day, to start off 2008 with your friends at Kyle's B&B! And be sure to check out the post below, for a detailed re-cap of Jeff Olsen's history at Kyle's B&B! 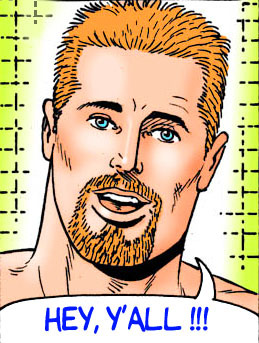 Since Jeff Olsen’s recent return to Kyle’s B&B, I’ve had some inquiries from newer readers of the strip for some background info on the hairy-chested hunk. So, without further ado, here are some highlights of Jeff’s long & illustrious history at Kyle’s B&B. Things were tense for a while there, but by the time Jeff got traded to another team in Alabama, (Episode # 11), he & Brad had reached what was essentially a truce. We didn’t see Jeff again for quite a few months, but he surprised everyone by showing up unexpectedly for Christmas in Episode # 38. By this point, he & Brad had forged somewhat of a friendship while playing on a winter-league baseball team in Brazil together. 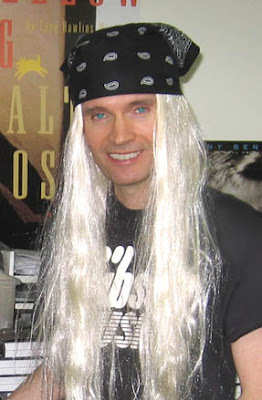 Jeff didn’t show up again until Episode # 86, but his surprise appearance for a Halloween party, in which the B&B guys were dressing up as the Village People, was especially memorable as he capably took on the role of the “Leather Guy”. And that leads us up to his recent return to the B&B in Episode # 217. How long will he be around for this time? That remains to be seen. But you can be sure there’ll be drama every step of the way… seems like Jeff just can’t help but create it wherever he goes! And a big thank you to everyone who sent me Happy Birthday wishes... I'm really touched! The Fall foliage is just about hitting its peak here on Long Island this week. I took these shots this morning, walking around my hometown of Northport. (Clicking on them will make 'em a bit larger, for your undiluted viewing pleasure!). Notice in the second pic, the gorgeous hills across the harbor, often seen in the backgrounds, through the windows, at Kyle's B&B. It's unusual for the leaves to hit their peak this late in the season. Normally, the foliage reaches its peak color around here during Halloween week. Yet, here we are, over 2 weeks later, and things are just getting into the vibrant color that marks Autumn's height. I don't know what you believe about global warming, but... clearly, we're having a remarkably warmer Fall season this year. However, things chilled down quite a bit last night, and today has been a crisp, cool, classic Fall day with strong winds rumbling through the trees. Time to break out the heavy quilts! You probably know that I often extoll the virtues of Vermont, and how I love traveling up there, etc. 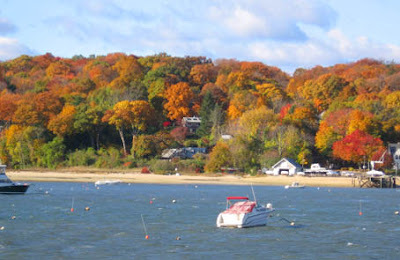 But Long Island has a beauty all of its own, with plenty of glowing maples & New England charm. 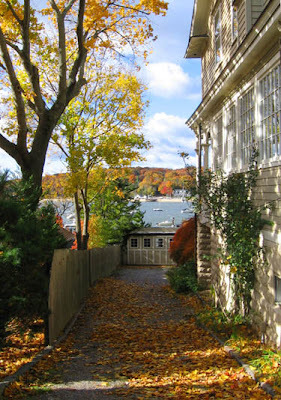 Especially the town of Northport, nestled up here on the north shore, with its harbor, clanging fishing boats, winding, hilly streets, and breathtaking sunsets . Sometimes I marvel at the sheer loveliness of living here. Certainly, it's what inspired me to set Kyle's B&B in this town. 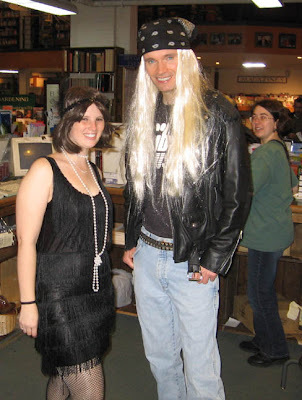 And be sure to check out my heavy metal Halloween pics, (next post down!). OH.... and being that this is Election Day here in the USA.... if that's applicable to you, well, don't forget to vote! 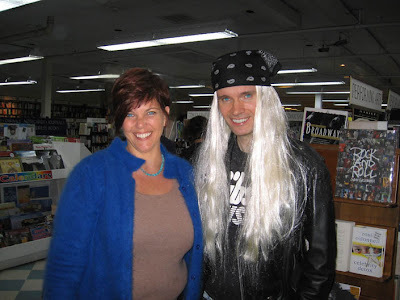 What better way to spend Halloween than being at a Slash book signing in Huntington, (the next town over from Northport), at my favorite bookstore in the world, Book Revue. 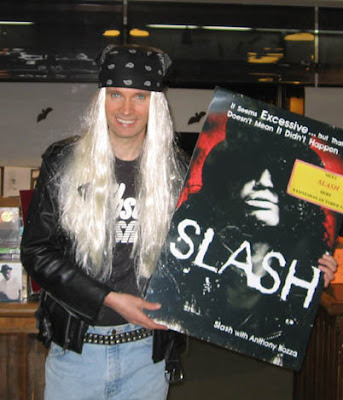 Slash, being Slash of Guns & Roses, now with Velvet Revolver, who just released his own autobiography this past month. Yes, that is really me in the picture above, (and in the several to follow, below), along with Caitlin as 1920s flapper, and Anne in the background. (Click it to see full sized). I guess those years I spent in rock bands and working as an electric guitar salesman left me with the ability to, when the time is right, work that 1980's metal rocker thing. (Or maybe not...you be the judge! LOL). And if you're wondering.... Slash was wonderful. Truly friendly, down to earth, a pleasure to meet and speak with. It was also fun to see lots of folks out in costume for the holiday. And I was a bit surprised to see so many young kids, pre-teens, who were there to meet Slash. Kind of cute to see some parents and kids who were both fans, there to meet him. I was also quite excited to run into my friend Sabine, who's here visiting from Los Angeles, (that's her with me in the third pic). I feel bad that I didn't get to take more pictures of the night... what ended up happening is that my friends took pictures of me, and that is the majority of pics that I have. And no, no pics here of Slash, save for the pic of his poster above. He had a strict no-photos rule, and while I got to meet him "behind the scenes" and have a nice, warm chat, the last thing on my mind was whipping out my camera and asking for a photo at that point. (For the record, he was wearing the famous top-hat, and he looked great!). All in all, a fun, wild, heavy metal Halloween night! This is an episode, (from August of this year), that you've seen already. However, here it is in a way you've never seen it before! Just CLICK on the episode image, at left, to view it at FULL SIZE. If you'd like to compare it to the original, just click here. What do you think? I'd love to hear your feedback. I was delighted to receive several e-mails from the Half-Jewish Network, commending me on the recent episode of Kyle's B&B that continues the story of Breyer's exploration of his Jewish & Irish-Catholic heritage. I wasn't aware of the group before this, but after looking at their website, (www.half-jewish.net), it was quite educational to learn about the range of issues that children of Jewish interfaith marriage, (marriages where one of the parents is Jewish and one isn't), face. In particular, the "Who Is A Jew?" page at their website shows the variety of factors involved. I've received a lot of very warm e-mails from readers over the past year or so who are children of Jewish interfaith marriages, who are really grateful to see this aspect of their lives explored in the comic strip. Well, it's an honor for me to do so, and I'm quite flattered that the Half-Jewish Network feels that I've captured this issue with accuracy. And I hope you'll visit their website if you get a chance! is easily available at Amazon; just click on the banner link below to get there! Temperatures are dropping just a bit as we head into this new month. There's a crispness in the air, and the leaves are just beginning to change color. In honor of the arrival of October here in the Northeast, (and the cooler weather & foliage changes that it brings), I thought I'd post a few pics of one of my trips to Vermont, (from last October, 2006). With all of these, you can click on them to see them at a larger size. The first pic, (above), is from a lovely little town called Danby in southwestern Vermont, just a bit north of Manchester. This area is particularly gorgeous in the way that the farms are squeezed into the narrow, rolling valleys between the mountains. The second pic is also from Danby, just a bit further south down the same road as the last pic. 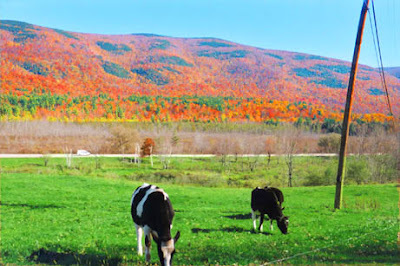 I wonder if the cows notice the gorgeous fall foliage blazing on the mountains behind them? This next pic, (above), is from East Dorset area, just a bit south of Danby, along the famed Route 7. Finally, I think I saved the best one for last. 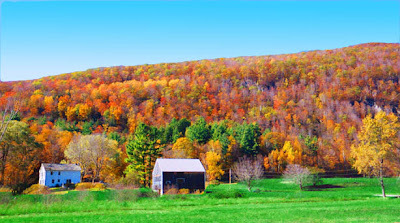 You really need to see this large, (click on it), to fully appreciate the gorgeous Fall colors. This one's actually from October, 2004, taken along Route 100, in the Waitsfield/Warren area, (also known as the Mad River Valley). When you see these Fall colors in real life, it's so gorgeous that these pics can't even do it justice. But enjoy, anyway.... and maybe make a trip to Vermont yourself this Fall! Happy Fall, (or Autumn), to everyone on the Northern Hemisphere.... and Happy Spring to all of my friends from down under! 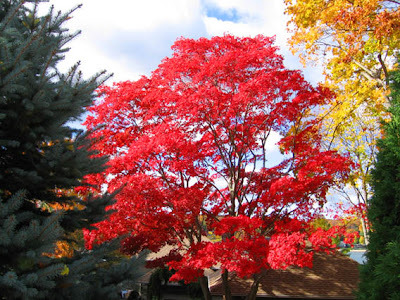 The glorious changing of the foliage colors hasn't quite begun yet here in Northport, (although an occasional tree here & there is sporting some red & orange). The Fall leaves actually reach their peak color here on Long Island during Halloween week, (always makes for a colorful Halloween), and the trees stay brilliant for almost all of November. 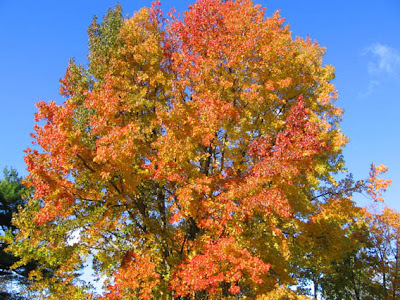 I'll be sure to keep you posted as the colors erupt in their Fall grandeur! The 2007 Cow Harbor 10K Run happened this past weekend in Northport; this is an annual event that happens here every September, and the runners come out in force to take on the challenging run through the hilly streets of Northport. And, once again, I dragged myself out of bed to cheer them on, (and to take some pics, posted below. As usual, click on 'em to see 'em larger). And finally, here's the guy I look for every year... (if you saw my pics from last year, he was in them, too). 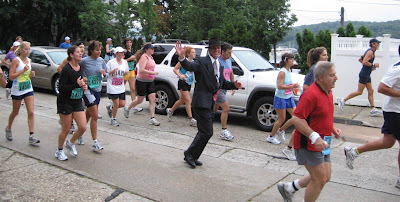 He always runs in some outfit that's completely out of place in a race; one year he was Indiana Jones, and for the past several years, he's been rockin' the business suit. I have no idea who he is, but he seems to remember me each year. He's awesome! By the way, I had mixed feelings about posting a new episode today, on this anniversary of September 11th. Would it have been wiser to wait a day, to alter the regular "every other Tuesday" publishing schedule of the comic strip? I gave it some serious thought, and realized several things. First of all, newspapers around the world, (and that would include all the comic strips published within those publications), aren't altering their publishing schedules because of today. It seems that there is a real need for publications to continue publishing regardless, or in fact because of, the circumstances happening in the world. Interestingly, (and completely unplanned by me), today's episode features 2 characters whose storylines & origins are intertwined with 9/11. So, perhaps it is a tribute to all of those affected by 9/11, to show these characters now thriving and moving on in their lives. My thoughts go out to all of those affected by September 11th, 2001.... here in the New York area, and around the world. Peace to all. Hmmm....how's that for confusing alliteration? Anyway, this is a quick message about the Kyle's B&B Notification List. 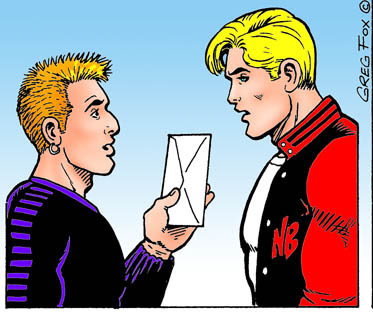 At this point, there are almost 5,000 people on the list, (if you don't know what I'm talking about, this is a list that Kyle's B&B readers sign up for to be sent e-mail notifications every time a new episode of the comic strip is posted here at the website). The problem is, over the past year or so, spam filters have become so intensive that I am getting back hundreds of "your e-mail did not go through" messages every time I send out a New Episode Notification e-mail to the list. On top of that, I'm getting lots & lots of e-mails from readers asking me why I "dropped them" from the Notification List, as they are no longer receiving Notification e-mails. The answer? I didn't drop you! The reason why you're not getting e-mail notifications is that your e-mail provider is most likely interpreting the Kyle's B&B Notification e-mail as spam, and blocking it from ever getting through to you. What's the solution? Ah, I'm so glad you asked! First of all, I went ahead and created a new Yahoo Group called Kyle's Notify List, for folks to join who want to be notified of new episodes. It seems that Yahoo is able to transcend a lot of the spam filters that are interfering with my own Notification e-mails. 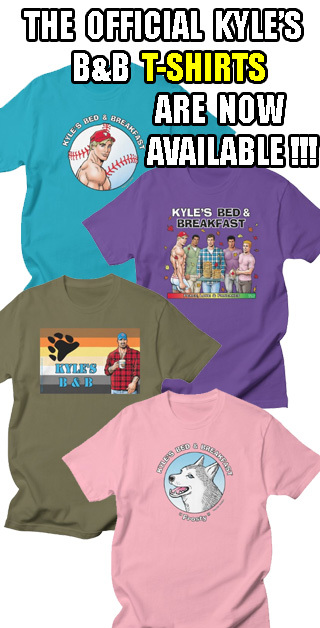 So, if you are having a problem receiving notification messages.... or, if you are new to the strip, and would like to be notified, I strongly suggest you join the Kyle's Notify List at Yahoo. The list is set up so that only the moderator, (that's me), can post messages. Therefore, you don' t have to worry about spam, unwanted e-mails from other group members, etc. There's no discussion, member comments, reader polls or anything like that. You will only be sent notification e-mails from me every 2 weeks, (along with the very occasional special message about the comic strip). And your e-mail address will be kept private from other group members, or anyone else, to see. So, what are you waiting for? It's quick, it's easy, and it's free, (sounds like a certain B&B character...oh, let's not go there!). Just click here to join the list! And THANK YOU to everyone who wrote with congratulations about the Lambda Legal contest win, and the article about it in the Advocate! It's been an exciting couple of weeks, and I'm so grateful for your good wishes & support, (I never would've won without your votes!). What a great thing, to get away to Vermont for a few days during the heat of summer on Long Island. As is often the case, it was cooler, breezier, and oh-so enticing in it's green mountain-loveliness. This pic above, (you can click on it to view it full size), was taken just outside of Johnson, VT, which is well north into the state, perhaps only about 20 miles or so from the Canadian border. As you may know from previous posts, I travel up to Vermont pretty regularly. I do hope to relocate there someday in the hopefully not-too-distant future. For now, I've been traveling to various parts of the state, to get more familiar with the various regions, (yes, there are a number of distinct regions of Vermont, despite the fact that it is a relatively small state). I've focused a lot of attention on northern Vermont, especially around Burlington. Though I wouldn't want to live right in Burlington, it's a super-cool city, and a great place to live nearby, to have access to all of the culture it is brimming with. However, after this most recent trip, I'm thinking that I need to start focusing on southern Vermont on my next few trips. Specifically, the southwestern region, which is a particularly gorgeous, mountain-filled area. So many times over the past few years, Ive blown through southwestern Vermont on my way up to Burlington. I usually stop for a quick break around Arlington, (former home of Norman Rockwell, one of my artistic heroes! ), and this time, I was absolutely floored by the beauty of the area. I suppose I have avoided actually staying there on any of my trips because of the notorious nearby Manchester Center, which is well-known as "shopping outlet center", and crawling with tourists. But I have to say, that is one very tiny part of the whole area, and to write off greater Manchester, Arlington and the surrounding area seems like a big mistake. So, I plan to correct that! Next time I go to Vermont, it'll be for the SW VT experience! By the way, I'm wondering what the gay population is like in that area. Again, Burlington seems to have the largest concentration of gay people in the state, from what I've seen so far. But I can't imagine southwestern Vermont doesn't have it's own gay contingent, what with the various art galleries, B&Bs, and general Vermont loveliness in the air. So.... if you're from that area of Vermont, or know someone who is, please write & tell me all about it. I'd love to hear your story! Wow! It’s official! I WON the Lambda Legal cartoon contest! How totally freakin’ cool is THAT?! The results have been published today in the latest issue of the Advocate, along with the cartoon itself, (I haven’t seen the article yet, but I hope to this week when the magazine arrives on newsstands here in Northport. I’ve already received a whole bunch of congratulatory e-mails from folks who are subscribers to the Advocate, who received the issue in the mail a few days earlier than the newsstands). Thank you, thank you, THANK YOU to everyone who voted for me! I have the best, most supportive readers in the whole world, and I appreciate everyone who took the time to vote for me at the Lambda Legal website! And, aside from all of this celebration chatter, I hope everyone gets a chance to become familiar with Lambda Legal and the important work they do to protect civil rights for LGBT people. 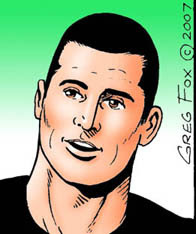 (In fact, if you want to see the winning comic strip, you can go to their website to view it). While the cartoon I submitted deals with the subject of "Life Without Fair Courts" in a humorous manner, the fact is that this is a deadly serious topic that deserves all of our attention. And it is to our great benefit that we have a vital organization like Lambda Legal that is fighting for our civil rights. So, what did I win besides all of this adulation and good cheer? Well… I won a free plane ticket to anywhere in the the USA, (48 states), or in Canada, that I choose to go! How awesome! I’m not even sure where I should go yet, (probably someplace far, just to make the most of it). If you have any suggestions, feel free to let me know! (I wanted to go to Alaska, actually, but that’s not within the 48 states. I’m also considering Calgary, Alberta, so I can check out those gorgeous Canadian Rockies. Or Oregon, as that’s one state I’ve never been to, and have heard great things about). Thank you, everyone! This totally ROCKS!!!!!! If you happened to be wondering about the Lambda Legal Cartoon Contest in which I was one of the 5 finalists, well, no... the winner has not been announced yet. 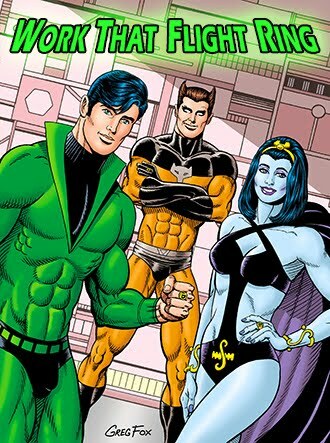 That is scheduled to happen on August 14th, apparently in the next issue of the Advocate. I'll keep you posted if I hear anything earlier, but as far as I can tell, the winner is being kept under lock & key until August 14th, so.... we're just gonna' have to wait a couple of more weeks to see who won! In any case, if you happened to have voted for me, I want to say a big THANK YOU! I really appreciate your taking the time! Just wanted to let you know, the "polls have closed" on the voting for the Lambda Legal "Life Without Fair Courts" cartoon contest (If you haven't heard, I am one of 5 finalists in this contest....Lambda Legal is an important national organization committed to achieving full recognition of the civil rights of lesbians, gay men, bisexuals, transgender people and those with HIV through impact litigation, education and public policy work). The winner is to be announced on August 14th, so... keep your fingers crossed, (well, not literally. That would make getting through the day awkward, no?). Oh, and if you're interested in seeing the 5 finalist cartoons in the contest, they are still posted at the Lambda Legal website for viewing. I just wanted to say a HUGE THANK YOU to everyone who took the time to vote for me, and to send me such warm, supportive, comments and e-mails. It was incredibly touching, and I am so, so grateful!